The traditional western string tie with slide. 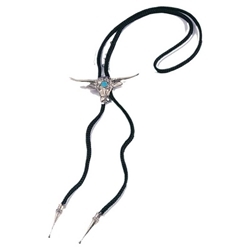 A Bolo Tie (sometimes bola tie or shoestring necktie) is a type of necktie consisting of a piece of cord with a decorative metal tip and secured with a slide. Great for a cowboy.